On Thursday, January 3, 2019, Governor Charlie Baker and Lt. Governor Karyn Polito were sworn in for a second term and delivered inaugural addresses in the House Chamber of the Statehouse. BOSTON – Today, Governor Charlie Baker nominated Jeffrey K. Clifford to the position of Associate Justice of the Quincy District Court and Terri Klug Cafazzo to the position of Associate Justice of the Middlesex Probate and Family Court. Attorney Clifford is a decorated veteran that has 19 years of legal experience of defending and prosecuting cases in the Commonwealth. Attorney Cafazzo has 10 years of experience in private practice and 18 years of experience as a First Assistant and Register in the Probate and Family Court. The District Court hears a wide range of criminal, civil, housing, juvenile, mental health, and other types of cases. District Court criminal jurisdiction extends to all felonies punishable by a sentence up to five years, and many other specific felonies with greater potential penalties; all misdemeanors; and all violations of city and town ordinances and by-laws. The District Court is located in 62 courts across the Commonwealth. For more information about the District Court, visit their homepage. The Probate and Family Court Department has jurisdiction over family-related and probate matters such as divorce, paternity, child support, custody, parenting time, adoption, termination of parental rights, abuse prevention, and wills, estates, trusts, guardianships, conservatorships, and changes of name. Judicial nominations are subject to the advice and consent of the Governor’s Council. Applicants for judicial openings are reviewed by the Judicial Nominating Commission (JNC) and recommended to the governor. 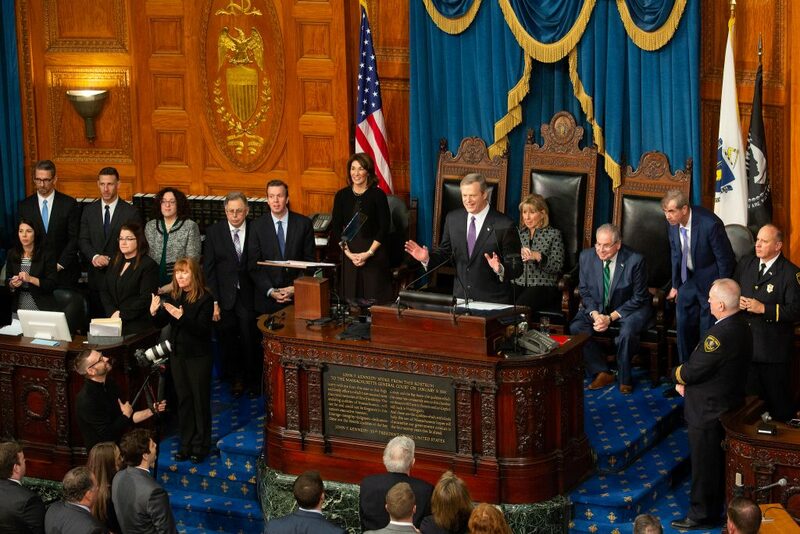 Governor Baker established the JNC in February 2015 pursuant to Executive Order 558, a non-partisan, non-political Commission composed of volunteers from a cross-section of the Commonwealth’s diverse population to screen judicial applications. Twenty-one members were later appointed to the JNC in April 2015. Since March 2000, Attorney Cafazzo has been a First Assistant Register and Administrative Deputy Assistant Register in the Essex Probate and Family Court. In that role, she manages operations of the court and performs quasi-judicial functions of a clerk magistrate and collaborates with Judges and the Register to address case management issues and implementation of efficient case processing. Attorney Cafazzo started as an Associate Attorney in the Law Offices of James J. Carrigan in 1990 where she handled worker’s compensation claims at the Department of Industrial Accidents, personal injury claims, including litigation and real estate closings until 1993. In June 1993, Cafazzo started her own private practice, trying criminal and civil cases in both the Massachusetts District and Superior Courts and appeared before the U.S. First Circuit Court of Appeals until taking on her current role at the Probate and Family Court in 2000. Recently she served on the 2025 Transition Leadership Team to guide and support the Probate and Family Court to the future that would improve quality of justice, efficiency and cost-effectiveness to better serve the needs of the public. She is currently working in concert with Chief Justice John D. Casey of the Probate and Family Court to implement the teams recommendations. Attorney Cafazzo earned her Bachelor of Science in Political Science from Boston College in 1986 and her Juris Doctorate from New England School of Law in 1989. Attorney Jeffrey K. Clifford has privately represented clients before the Massachusetts District Court, Superior Court and U.S. District Court since 2007. Attorney Clifford began his 19-year career in 1998 as Assistant District Attorney in the Norfolk County District Attorney’s Office until 1999. In April 1999, Clifford served as Assistant Regional Counsel in the Boston Department of Social Services until November 2000, where he prepared and litigated care and protections cases before the Boston Juvenile Court. From November 2000-November 2004, Clifford served as Assistant District Attorney in the Suffolk County District Attorney’s Office, prosecuting cases in the District and Superior Courts and serving as a member of both the Gang Unit Liaison to the Youth Violence Strike Force and of the Homicide Response Team. In November 2004, he became Assistant General Counsel and Manager of Compliance and Enforcement at the Massachusetts Department of Industrial Accidents, enforcing workers compensation laws throughout the Commonwealth, until opening his private practice in 2007. Attorney Clifford served in the United States Marine Corps Reserve from 1990-1996 and 2005-2006. He served in the Persian Gulf War and in Operation Iraqi Freedom. Clifford has served as President and Treasurer of the Norfolk County Bar Advocates, where he currently serves as Vice President. Additionally, he is a member of the Federal Criminal Justice Act Panel and a Senior Mentor in the Advanced Trial Training Program for new lawyers. Attorney Clifford earned his undergraduate degree from the University of Massachusetts—Boston in 1995 and his juris doctor from Catholic University School of Law in Washington, D.C. in 1998.